I have some questions about redshift. I think that the first two hang on the last two, but feel free to point out anything you think I should know. How do we know if an object is actually redshifted, and that we aren't just seeing the regular spectrum of the star? How can we tell the extent to which a star is redshifted? Do astronomers have a full baseline spectrum that they compare the measured spectrum against? Or do they just use the hydrogen spectrum since all stars are mostly hydrogen? 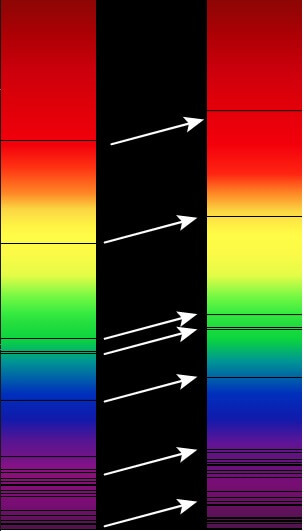 We have very extensive reference spectra of all the elements under a wide variety of conditions, so when a star is bright enough we see many spectral lines and can match them up to reference spectra. No two elements have similar spectra, so if you can see many lines, you can't easily confuse one for another. When you can account for nearly all of the lines in a star's spectrum by a plausible set of elements in plausible abundances and all with the same red shift, you have a very, very reliable match and accurately know the object's red shift. But distant stars (and galaxies) are very faint and so the spectra we get are very low resolution and show only a few of the strongest spectral lines. They can frequently be matched because hydrogen is so common that the strongest lines seen will be hydrogen lines and even if you can only spot two or three of them, if they bear the same relative positions as bright hydrogen lines, you can safely identify them and read off the red shift. This is less reliable, but still reliable enough that it rarely is a problem. Not the answer you're looking for? Browse other questions tagged the-sun distances redshift or ask your own question. How can we be sure that we have identified very distant stars correctly? How do we know that the intrinsic brightness of Cepheid variables corresponds to their period? How Do we know about redshift? How do we know that light is redshifted/blueshifted and not the original light of a star/galaxy? How can you estimate distance of an object by its redshift? How do astronomers know when the Sun will die?